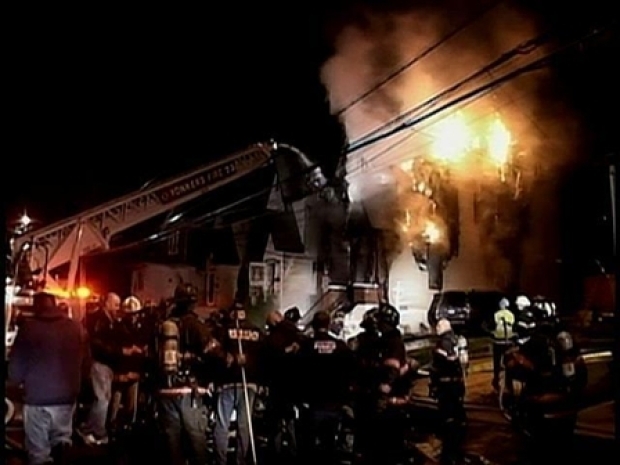 Flames leapt out of a house in Yonkers just after midnight Friday. Eighteen people were taken to the hospital, including 13 firefighters. One firefighter suffered a crushed hand – the most serious injury to a firefighter – from setting up a ladder. Fire crews prevented flames from spreading to neighboring homes. Five people who lived in the building suffered minor burns and smoke inhalation. Eighteen people are taken to the hospital, including 13 firefighters, after a blaze erupts in a Yonkers house overnight. When fire crews arrived, a man and two teens trapped on the fire escape were about to jump. Firefighters were able to get them to safety. The three-alarm fire destroyed the building on Alexander Avenue.